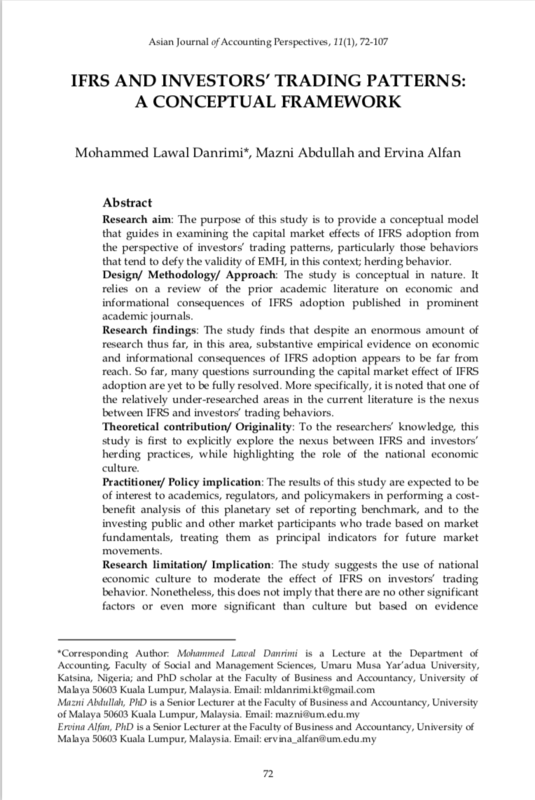 Research aim: The purpose of this study is to provide a conceptual model that guides in examining the capital market effects of IFRS adoption from the perspective of investors’ trading patterns, particularly those behaviors that tend to defy the validity of EMH, in this context; herding behavior. Design/ Methodology/ Approach: The study is conceptual in nature. It relies on a review of the prior academic literature on economic and informational consequences of IFRS adoption published in prominent academic journals. Research findings: The study finds that despite an enormous amount of research thus far, in this area, substantive empirical evidence on economic and informational consequences of IFRS adoption appears to be far from reach. So far, many questions surrounding the capital market effect of IFRS adoption are yet to be fully resolved. More specifically, it is noted that one of the relatively under-researched areas in the current literature is the nexus between IFRS and investors’ trading behaviors. Theoretical contribution/ Originality: To the researchers’ knowledge, this study is first to explicitly explore the nexus between IFRS and investors’ herding practices, while highlighting the role of the national economic culture. Practitioner/ Policy implication: The results of this study are expected to be of interest to academics, regulators, and policymakers in performing a cost-benefit analysis of this planetary set of reporting benchmark, and to the investing public and other market participants who trade based on market fundamentals, treating them as principal indicators for future market movements. Research limitation/ Implication: The study suggests the use of national economic culture to moderate the effect of IFRS on investors’ trading behavior. Nonetheless, this does not imply that there are no other significant factors or even more significant than culture but based on evidence documented in the prior studies there is no support for the contention that national economic culture is inconsequential.